More biofase testimonials keep coming in proving how well biofase for yeast works. You could be one of them. I am almost finished with my first bottle of Biofase and the results have been fantastic. I have had candida issues for about 2 years now. I've tried everything, literally thousands of dollars worth of products and doctors visits. So far enzymes, probiotics, and homeopathy are the only things that have worked for me. These enzymes in particular seem to have given me a huge boost towards recovery. I still have some gas and bloating but I'd say it has been reduced by about 50% or more. I'm hoping the next bottle will make that 100%. I've even been able to eat some sugar without my yeast infection coming back. I have found that Biofase is definitely helping with my digestion. I hardly have any bloating, gas, belching after meals which is great because before starting your systemic yeast protocol this was a huge problem. I will continue with Biofase and Profase as long as necessary in order to get my yeast issues under control. I believe that I may need to take a probiotic for maintenance once everything is back in balance and I have no doubt that Profase is one of the best on the market. Biofase is the first enzyme that I have ever taken so I can't really compare it to others out there however its effects are paramount in tackling my yeast overgrowth. I sincerely thank you for making these products available and for keeping the price reasonable. Tackling my yeast overgrowth has proven to be a costly expenditure so this I'm sure is a big help to many others as well. Several months ago I was put on a long term antibiotic. I developed multiple yeast infections including recurring oral thrush that would not go away. I was following a modified candida diet, taking probiotics and natural antifungals, and had taken 2 courses of both Diflucan and Nystatin ~ all with little or no improvement. I was about to begin my 3rd round of Nystatin when I tried Biofase. By the 3rd day, I noticed a small patch was beginning to clear on my tongue. Finally! The sensation of extreme dry mouth went away and it became easier to swallow. Healing and progress continued to be steady and within 3 weeks my tongue was clear. I am a huge believer in Biofase and will continue to take it. As I mentioned, I have only been able to do a modified candida diet - not a strict one (due to other health reasons). Still, Biofase works. Thank you for making this wonderful product! I have been battling the monster in my gut for years. Gave up gluten, sugar and all sweeteners and have been taking probiotics and enzymes for many years. Eating living foods and staying off antibiotics. I have had great success using this product and appreciate the indepth research and detailed explanation of how the Candida grows and flourishes. I stopped taking the Biofase because I ran out and found the monster started to make a comeback, I have just ordered more and have recommended this product to everyone. I will continue using Biofase until the Candida is gone or at least under control.. I have tried many different products for candida and could not tolerate the die-off. I have struggled with candida since childhood due to many courses of anti-biotics for infections. Biofase/Profase are the first products I have used that I have felt really addressed the candida problem without severe die-off effects. For sure, I did have some die-off initially, but after 2 weeks, I felt immense improvement and even felt that the sugar free diet was tolerable rather than a constant daily battle. I am not done treating the candida but am eagerly making my second order for a 180 count bottle of Biofase so that I can continue to feel better and conquer the candida. Thank you for all the info, your emails and website. I'm telling all my friends about you and your website. My scalp breakout is gone! I was scheduled yesterday for a biopsy but had to cancel. I have no more. I do believe that the Biofase and diet is the reason. After being on 4 antibiotics in one year I developed a yeast infection that I could not get rid of. I had suspected that I had a Candida issue prior to that because of the way I craved sugar and bread. I started taking Biofase and following the diet. I also took massive doses of probiotics. After completing my second bottle of Biofase I noticed that the heartburn issues I had suffered from for many years were improving. I ordered a third bottle. Halfway through that bottle I realized my quality of life was better than it had been in ages. I am planning to order my fourth bottle shortly. I intend to continue using these enzymes indefinitely. I am pleased to continue with suggestions... Thank you Dan, for kindly caring as you do & making helpful products available. Thank you very much for creating amazing website which covers everything about yeast-beast. I had been on prednisone for years and Prilosec for 20 years. I had many chronic yeast symptoms and hypothyroidism. I started natural healing almost year ago taking many different candida herbal antibiotic and serrepeptease one after another. Symptoms were going down only for short time but kept coming back. I did your candida cleanse protocol and diet last month taking biofase, CP1, colostrum, oregano oil, sf722, Humaworm cleanse, and zeolite. I am almost candida free. Thank you again for invaluable information and great product. infections. I had been on a candida diet for 8 weeks, but wanted to ensure that the problem did not recur, as in so many other cases I'd read about. I took your Biofase daily, building up to 4 pills a day, and I noticed a significant difference. Less bloating almost immediately and over time, less reflux. I just recommended the product to a friend T.M. from Louisville KY and he placed his order today! I'm going to order another round to have on hand for periodic maintenance and cleansing. Thanks again for making such a well designed product! I have just finished my first bottle of Biofase (90 caps). I have found that it dramatically helps my elimination. 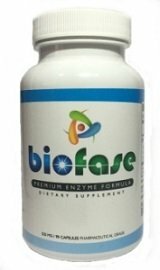 I have had slow elimination for over a decade and the Biofase seems to increase peristalsis and is really turning things around for me. My elimination is definitely better at 6 biofase per day. I have started slow because I am sensitive to most supplements. I will add Profase soon. It's been a while since I last talked to you about my daughter. The last time we corresponded (last August 2015, I think) my daughter age 14 was being treated for very high yeast that was found in her stool. She was doing the anti candidiasis diet, taking high dose probiotics, biofase, garlic and oregano supplements. Since then back in December the doc tested her for isolated yeast and it came back negative. I just wanted to say thank you! This is an update. I have just finished my first bottle of Biofase (180 caps) and have reordered. I tend to be sensitive to supplements and have had no issues with Biofase. I am taking it for chronic yeast, and my symptoms have been improving so I will continue. It continues to help a lot to keep me regular, and this benefit alone is worth it. Thanks, Dan, for the progress that I've been able to make since beginning your Biofase enzymes five weeks ago. At that time, I had an extremely painful bladder infection as part of the Candida infection which has blighted almost all my adult life (I'm 40). You were also very kind in replying promptly to a couple questions I had about the treatment. I am happy to report that my energy, appetite and concentration have improved overall (for example, resuming regular exercise and stepping up my songwriting work). As the other testimonials will agree, this is not a 'magic bullet'; and anyone following this protocol should adhere closely to your dietary advice too, along with listening to his/her body with regard to food intolerances and reactions. Being very limited food-wise, that's tough - but any 'dips' I've noticed while taking Biofase have been briefer and easier to manage. With my appreciation, and best wishes for your continued success! I have been on the biofase with the 11-strain probiotics for a while now, maybe 2 years. I had first used it for a bad yeast infection, which is gone, and I noticed that it has helped me with my rosacea. I have tried being off the biofase and probiotics and the rosacea would come back on my face. I have tried just the probiotics by itself, and just the biofase by itself. For some reason, the combination of both reduces the rosacea on my face drastically. I will keep using both. I just wanted to let you know that I ordered biofase one time last year because I was having horrible scalp issues. I used it for one month and my scalp completely healed. I sense that these problems might be coming back so I am ordering another bottle today. I ran out of Biofase and did not reorder because it seemed my constipation issues had resolved. Over a span of 2 months I have become less and less regular and am now back to constipation- ugh. I though perhaps my yeast was under control, but apparently not. I think I need to stay on the biofase to stay regular while I chelate heavy metals. I just reordered. I have to say, I was a little skeptical about trying Biofase at first but after all the yeast symptoms I've been experiencing I had nothing left to lose. The symptoms were taking over my life in the worst ways imaginable. That being said, Biofase has been life changing. Seriously. The first 5-7 days I felt a little sluggish, scratchy throat, and just the slightest bit foggy, but then it was like my energy level returned 10x. It has been months since I could remember feeling this 'normal.' I don't have to tip-toe around my day-to-day routine in fear of GI upset or triggering a yeast infection. These past few weeks have been amazing. I'm so grateful for this product and all the research that has gone into developing it. First, I want to thank you so much for your dedication and efforts with this site. I have spent the past two years attempting to heal my body after a trauma-induced autoimmune thyroid condition. Initially, I really needed to focus on the acute symptoms but, once I had those under control, with research I realized that I needed to heal my gut and deal with candida overgrowth. I did the recommended colon cleanse and then began the biofase and profase regimen. It wasn't until I started using biofase and profase that I began to notice a reduction in my dermatitis symptoms and the ability to re-introduced inflammatory foods (dairy and gluten). If I can offer any advice to those pursuing this treatment is to continue with these supplements. It's tempting to think you are 'cured' once you notice a reduction in the concrete symptoms. However, after running out of my initial stock of biofase and profase, I realized that there is still more work to do. I'm grateful, though, that now I know how to treat this and will be ordering more today! I want to thank you so much for your great website and all the help getting rid of my decades old battle with candida. It is a tough bug to get under control. But one's health is worth more than gold. I now take Biofase almost every morning for continuing control of candida, so it won't come back, and enzyme therapy for joints and cleansing. Your website and your recommendations for supplements helped me so much in the fight against my overgrowth of candida. I'm so happy to have this knowledge to keep candida away and be in control of my health. I just wanted to thank you. It's only been 48 hours since I have been taking Biofase. I feel incredible. Such relief. I will be getting more soon. Ty! Any questions about BioFase or yeast infections in general, please use the contact form at the bottom of the contact page. To enter your BioFase testimonial and receive a 10% discount on your next order, please use the form below.